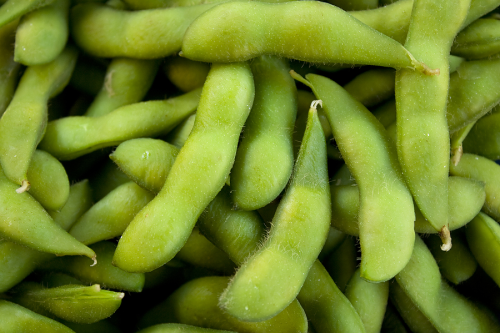 02/10/15 -- Soycomplex: Beans closed lower on the day and for the week. So too did meal, which is now within $2 of the lowest close on a front month since late 2011. FCStone late yesterday raised their estimate for 2015 US soybean yields from 45.4 bu/acre to 46.9 bu/acre, taking production up from 3.791 billion bushels to 3.919 billion. Informa raised their average yield figure to 47.2 bu/acre with production at 3.878 billion bushels. The USDA get a chance to revisit their predictions next Friday. Last month they were at 47.1 bu/acre and 3.935 billion bushels. Dr Cordonnier said that Mato Grosso soybean plantings have got off to a tardy start awaiting the arrival of rain. Only 0.5% of the crop has been planted in the state so far. Southern Brazil, where rains have been plentiful, is off to a better start. Parana is 10% sown versus 7% a year ago at this time, say AgRural. Nationally about 2% of the crop is said to be planted. The Philippines are seeking soymeal for Nov-Dec shipment and South Korea are in the market for meal for Feb-March shipment. Stats Canada estimated their 2015 canola crop at 14.3 MMT versus an average trade estimate of 14.5 MMT, That's up nearly 1 MMT from their August estimate of 13.34 MMT, but down more than 2 MMT from the 2014 crop of 16.41 MMT. Ukraine said that they'd harvested almost 2 MMT of soybeans off 53% of the planned area. The Ukraine sunflower harvest is 75% done at 7.7 MMT. The Commitment of Traders report shows fund money net short around 30.5k lots on beans as of Tuesday night, that's the best part of 16k contracts less short than they were the previous week. Nov 15 Soybeans closed at $8.74 1/4, down 3 cents; Jan 16 Soybeans closed at $8.78 1/4, down 2 1/2 cents; Oct 15 Soybean Meal closed at $298.50, down $4.10; Oct 15 Soybean Oil closed at 27.84, up 75 points. For the week that places front month beans 15 cents lower, with meal losing $10.20 and oil rising 12 points. Corn: The market closed little changed on the day and for the week. FCStone estimated 2015 US corn yields at 167.0 bu/acre, up from 165.9 bu/acre previously. They now peg production at 13.541 billion bushels, up from 13.457 billion a month ago. Informa went for 168.4 bu/acre and 13.561 billion bushels. The USDA were at 167.5 bu/acre and 13.585 billion bushels in September. Russia said that it's 2015 corn harvest was 34% complete at 4.7 MMT. Ukraine said that it's corn harvest was 24% done at 4.66 MMT. Yields there are still way below what the USDA is projecting. The Ukraine Ag Ministry lowered their 2015 grain harvest estimate to 58.5 MMT, including 22.2 MMT of corn. The USDA still have the latter at 27 MMT. FranceAgriMer said that the French corn harvest was 9% done as of Sep 28, up 5 points in a week and 2 points ahead of this time last year. Stats Canada estimated the 2015 corn crop there at 12.2 MMT, marginally lower than the average trade estimate of 12.3 MMT. Their August estimate was 12.31 MMT and production last year was 11.5 MMT. "The Midwest forecast is much wetter. Heavy rainfall is predicted in Kansas and Nebraska, northward into Iowa, South Dakota and Minnesota, then spreading eastward across Wisconsin. At least 0.75 inch of rainfall is expected, but 2.5-3 inches locally October 5-8. If the wet forecast verifies, it would set back corn and soybean harvesting that up until now has made good progress," said Martell Crop Projections. The US dollar is weaker following the release of the September jobs report. "That report was so bad that it pushed off expectations for a Fed rate hike to March, if not the end of 2016," said Arlan Suderman of Water Street Solutions. That could underpin US grains going forward as the market had been expecting US interest rates to start to rise before the end of the year. Dec 15 Corn closed at $3.89 1/4, up 1/2 cent; Mar 16 Corn closed at $3.99 1/2, down 1/4 cent. For the week Dec 15 corn was up 1/4 of a cent and Mar 16 was down 3/4 of a cent. Wheat: The market closed around 4-7 cents lower. The Ukraine Ag Ministry estimated their 2015/16 grain exports at a record 36.5 MMT. They see wheat production there this year at 26.2 MMT, and barley output at 8.3 MMT. Old crop carryover stocks were 10.3 MMT and new crop carryout will likely fall to 8.75 MMT, they predict. Stats Canada estimated their all wheat crop at 26.06 MMT versus an average trade estimate of 25.1 MMT. That's up from their August estimate of 24.6 MMT, although lower than last year's crop of 29.4 MMT. 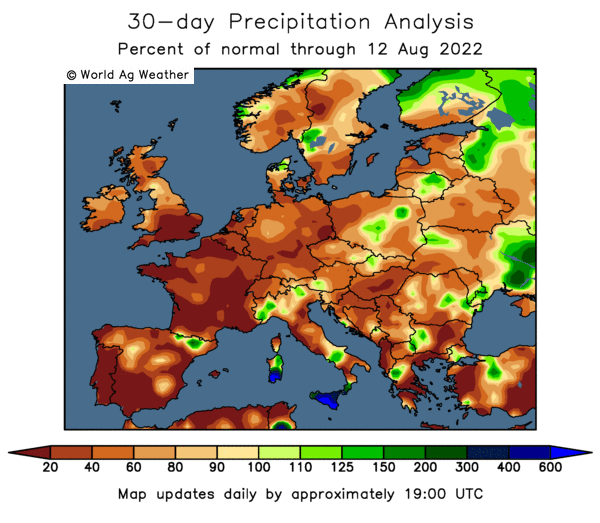 The bulls continue to point to dryness in Southern Russia and Ukraine where "it is already getting late for the crop to get established ahead of the region’s typically harsh winters. Making matters worse, abnormally cold readings are expected over the next couple weeks, making it even more difficult for the crop to develop a root system ahead of going dormant in late October and early November," said Arlan Suderman. The Russian Ag Ministry say that winter plantings are 69.5% complete on 11.9 million ha, which is half a million more than this time last year. They also say that this year's wheat crop is 93.2% harvested at 61.4 MMT. Barley is 94% harvested at 17.6 MMT, they add. Indonesia were said to have bought 60,000 MT of Australian wheat for Dec-Jan shipment. Thailand is buying Black Sea area wheat for October–March shipment. The Philippines are said to be looking for 50,000 MT of milling wheat for March-April shipment. Egypt released a tender after the market closed for wheat for Nov 1-10 shipment, with the results expected on Monday. It will be interesting to see where the Russian offers line up now that they have changed the way that their export duty is calculated. Ukraine said that they'd exported almost 10 MMT of grains so far this season, including almost 5.5 MMT of wheat. Dec 15 CBOT Wheat closed at $5.13 1/4, down 5 cents; Dec 15 KCBT Wheat closed at $5.00 1/2, down 7 cents; Dec 15 MGEX Wheat closed at $5.27 1/4, down 4 cents. For the week that puts Chicago wheat up 5 1/2 cents, with Kansas up just 1/4 of a cent and Minneapolis up 4 1/2 cents. 02/10/15 -- EU grains closed mixed but mostly a little lower on the day and for the week. At the close, Nov 15 London wheat was down GBP1.30/tonne to GBP115.55/tonne, Dec 15 Paris wheat was EUR0.50/tonne easier at EUR175.75/tonne, Nov 15 Paris corn was EUR0.25/tonne higher at EUR162.00/tonne, whilst Nov 15 Paris rapeseed was down EUR0.25/tonne at EUR368.50/tonne. For the week that puts London wheat GBP0.25/tonne lower, and in Paris wheat was EUR0.75/tonne easier, with corn down EUR3.25/tonne whilst rapeseed lost EUR1.25/tonne. It's been a fairly choppy week. 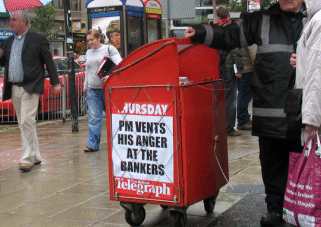 with the market being pulled this way and that by conflicting news. Talk of dryness for winter plantings in Russia, Ukraine and the US leans mildly supportive, although there's still time for Mother Nature to intervene and correct most of these problems. EU and US wheat exports continue to struggle in the face of strong competition from the Baltic and Black Sea however. Brussels issued 456.7 TMT worth of soft wheat export licences this past week, a 9% decline on a week previously. France is struggling to maintain it's market share too, they only picked up 21% of this week's licences, down from 33% the previous week. So far this season cumulative soft wheat export licences now total 5.2 MMT, which is 23.5% below where they were this time a year ago. Earlier this week the EU Commission forecast EU-28 soft wheat exports in 2015/16 to fall a more modest 14%, and the USDA currently only has all wheat exports down to decline by 8% this season. For sure some pick up in export pace can be expected in the second half of the season, as Ukraine and Russia traditionally "front-load" their sales programme, although Russia's exports have been slower than normal due to the floating duty on wheat sales which was only reduced yesterday. France account for nearly 37% of all soft wheat export licences so far this season (nearly 1.9 MMT worth), with Germany in second with around 19% (just over 1.0 MMT) and Lithuania in third with over 10% (534 TMT), just ahead of Romania with 10% (517 TMT). The UK? A princely 4,050 MT worth of our wheat has been sanctioned for export outside of Europe so far this season. EU-28 barley sales have been better though, with 135.6 TMT worth of export licences released in the past week, up 19% from the previous week, and with France accounting for 79% of those, up from 43% the previous week. Season to date barley export approvals now stand at 3.4 MMT, up 48% from a year ago. France has 34% of that market, followed by Germany with 21%, the Netherlands with 18% and Romania with nearly 16%. The UK scores a bit better here, with just over 7% (25,420 MT) of barley approved for export outside the EU. The dryness in Ukraine that's held up winter grain and rapeseed plantings, also seems to be having a detrimental effect on corn yields. They've harvested just over 1 million ha of corn so far, around 24% of the planted area, producing a crop of 4.66 MMT to date with yields averaging only 4.64 MT/ha. Whilst yields are creeping higher as the harvest progresses, consider how much they need to improve to get anywhere near the USDA's forecast of 6.59 MT/ha. Clearly that isn't going to happen. The Ukraine Ag Ministry now forecast their 2015 corn crop at 22.2 MMT, with total grain production at 58.5 MMT (that was predicted at 60.5 MMT a month ago). The USDA still have Ukraine corn output at a very optimistic 27 MMT this year. Russia's corn crop however is on track to match the USDA's forecast average yield of 5.0 MT/ha. 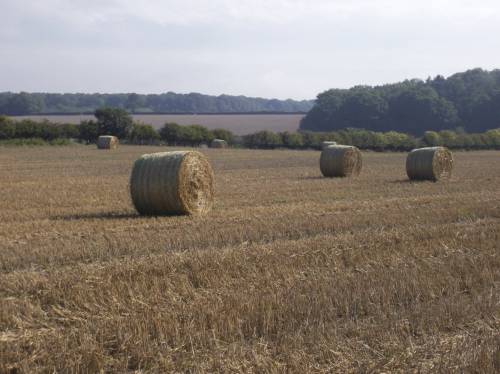 They're 34% harvested so far, producing a crop of 4.7 MMT to date with yields averaging 5.01 MT/ha. Russia's 2015 wheat harvest is now said to be entering the home straight at 93.2% complete for a crop of 61.4 MMT so far. Yields are averaging 2.57 MT/ha, say the Ag Ministry. The USDA have these down to cross the finishing line at 2.37 MT/ha. Russian winter grain plantings are said to be complete on 11.9 million ha, or 69.5% of the planned area. That's 0.5 million ha more than this time last year when dryness was also an issue. "Weather conditions have become unfavourable in Russia’s winter wheat with intensifying drought late in September. Rainfall has been virtually non-existent the past 2 weeks in the Southern District, Chernozem and Volga. Strong drying was accompanied by unusually hot temperatures, near 80 F, increasing evaporation and further sapping field moisture," say Martell Crop Projections. "The forecast continues dry this next week. Sharply cooler temperatures are also predicted affecting the northern half of the wheat belt. 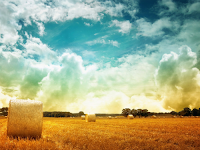 Southern Russia winter wheat areas would continue warm," they add. In Ukraine, winter grains plantings (almost entirely wheat) are said to be 50% complete on 3.7 million ha. Winter rapeseed planting has only been completed on 69% (568k ha) of the intended area, and that's up just two percentage points in a week, suggesting that little more is going to get sown now. 01/10/15 -- Soycomplex: Beans closed lower, despite weekly export sales beating expectations at over 2.5 MMT, primarily for China (1,178,400 MT) and unknown destinations (826,800 MT). How much of the Chinese business was part of last week's showcase 13 MMT deal is unclear. Exports of 814,900 MT were primarily to China (318,400 MT), Germany (150,100 MT), Mexico (119,100 MT), the Netherlands (85,700 MT) and Indonesia (76,300 MT). The USDA also announced 120,000 MT of US beans sold to China for 2015/16 shipment under the daily reporting system. IMEA said that Mato Grosso farmers are already 40% sold on their largely as yet unplanted new crop soybeans, and Cerealpar estimates forward sales even higher at 45-50% due to the weak real. Credit Suisse said that the real, currently trading at around 4.00 to the US dollar would slip to 4.25 by the end of the year and 4.50 inside 12 months. The inaugural USDA soybean crush report showed 146 million bushels of soybeans were crushed in August versus the average trade estimate of 142 million. China’s Golden Week started today so their markets will be close until Oct 7. Nov 15 Soybeans closed at $8.77 1/4, down 14 3/4 cents; Jan 16 Soybeans closed at $8.80 3/4, down 13 1/4 cents; Oct 15 Soybean Meal closed at $302.60, down $5.70; Oct 15 Soybean Oil closed at 27.09, down 1 point. Corn: The corn market closed around a cent higher. Weekly export sales of 748,200 MT for 2015/16 were up 76 percent from the previous week. Mexico (638,600 MT) was the largest buyer. ranged from 700,000 MT to 1.0 MMT. Exporters typically sell 34% of the marketing year’s final corn shipments by this point but are only 22% sold currently. "Strong cooling is predicted in the upcoming week, more in line with seasonal norms in October. Overnight minimum temperatures in the Upper Midwest are expected to drop into the mid 30s F on Sunday and Monday mornings. A hard freeze is not expected, however. The United States corn was 71% ripe and 'safe from frost' as of September 27th, USDA’s most recent report. Corn conditions were 65% good-excellent, 22% fair and 10% poor, much higher than soybeans but worse than 2014 on the same date. Eighteen percent of US corn was harvested, slightly behind 23%, the 5-year average," said Martell Crop Projections. Russia said that their corn harvest is 34% done on 930k ha producing a crop of 4.7 MMT to date. Ukraine said that they'd exported 9.8 MMT of grains so far this season, including 5.45 MMT of wheat, 2.91 MMT of barley and 1.45 MMT of corn. Dec 15 Corn closed at $3.88 3/4, up 1 cent; Mar 16 Corn closed at $3.99 3/4, up 1 cent. Wheat: The wheat market closed higher, despite very poor weekly export sales of only 77,100 MT - easily the lowest of the marketing year so far. Exports of 564,400 MT were better, but were still down 8 percent from the previous week. Cumulative season to date sales are down 18% on where they were this time last year, yet the USDA forecast full season exports almost 10% higher in 2015/16. Total commitments for the current season are 45% of the USDA's target compared to 58% a year ago and 53% typically at this time. Apart from last season, this year's export target is the lowest in forty years, according to Arlan Suderman of Water Street Solutions. To be this far behind last year already then is therefore a concern. Japan bought 128,489 MT of food wheat for Oct-Nov shipment in it's regular weekly tender today, split between US, Canadian and Australian origins. Jordan are tendering for 100,000 MT each of wheat and barley. Oman cancelled a tender for 60,000 MT of Russian wheat for Nov shipment, citing high prices. India was said to have imported more than 120,000 MT of wheat in August, taking their season to date imports to around 420,000 MT, the most since 2010 following the low quality of this year's crop. Much of those imports have been of Australian origin. The Russian Ag Ministry said that they'd harvested 95.5 MMT of grains off 89.2% of the planned area with yields averaging 2.41 MT/ha versus 2.52 MT/ha a year ago. Wheat harvesting is 93.2% complete at 61.4 MMT with yields of 2.57 MT/ha, a 5% decline on a year ago. Barley harvesting is 94% complete at 17.6 MMT. Ukraine's Ag Ministry estimated this season's grain crop at 58.5 MMT, with exports in 2015/16 at a record 36.5 MMT. Their 2015 wheat harvest was pegged at 26.2 MMT, and this year's barley crop pegged at 8.3 MMT. Stats Canada are due to release their latest crop production estimates tomorrow. Dec 15 CBOT Wheat closed at $5.18 1/4, up 5 1/2 cents; Dec 15 KCBT Wheat closed at $5.07 1/2, up 5 3/4 cents; Dec 15 MGEX Wheat closed at $5.31 1/4, up 4 1/4 cents. 01/10/15 -- EU grains traded mostly a bit higher to begin the new month. It is also the beginning of a new quarter of course, and indeed the final one of 2015 (shockingly there's only 85 more sleeps until Christmas if you are interested!) As far as global stock markets go, Q3 just ended was the worst quarter in 4 years, say the BBC - led by China's Shanghai Composite falling 25% which dwarfs the FTSE 100's "mere" 7% decline. At the close, Nov 15 London wheat was up GBP1.25/tonne at GBP116.85/tonne. In Paris, Dec 15 wheat was EUR1.75/tonne higher to EUR176.25/tonne, Nov 15 corn was up EUR0.50/tonne at EUR161.75/tonne and Nov 15 rapeseed was EUr1.25/tonne firmer at EUR368.75/tonne. Russia's new export duty on wheat kicks in today, and it's much less punitive than the one it replaces. The rate at which a more than token duty now kicks in is raised from RUB11,000/tonne to RUB13,000/tonne. At today's exchange rates that's around $200/tonne. With current October FOB prices around the $187/tonne mark, rising to around $190-195/tonne for December shipment, Russian exporters are safe - for now. Under the previous system, shippers exporting wheat in September were having to pay an export duty of around $7.50/tonne. As from today that drops to a nominal figure of around 15 cents/tonne. All this is based on current exchange rates, which can of course alter. Any further significant fall in value of the rouble against the US dollar between now and the end of the year, and/or a rise in global wheat prices could set Russian exporters squealing again. For now though it looks like they may now begin to start beginning to catch up with last year's export pace. Now that the duty has been lowered, Rusagrotrans estimated the country's 2015/16 wheat exports at 22-23 MMT (the USDA are already at 23 MMT themselves). The Russian 2015 grain harvest is now said to stand at 94.9 MMT, some 2.1% down on this time last year. Final production is estimated at 100-103 MMT by the Russian Ag Ministry. The Kazakh harvest meanwhile is almost 83% complete at more than 15 MMT. The Ukraine harvest is 77% done at 41.3 MMT. Yesterday's revised EU Commission's production numbers were around the middle of the range of trade estimates. 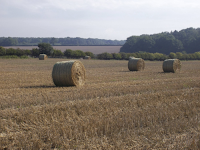 They place the soft wheat crop here down 2.8% on last year's record, with barley output down 2%. OSR production meanwhile will fall 13.2% and corn output will slump 22.4%, if their figures are correct. The USDA are due to update us with their revised world crop production and demand/stocks estimates a week tomorrow. 30/09/15 -- Soycomplex: Beans closed around 6-7 cents higher, as the USDA pegged Sep 1 US soybean stocks at 191 million bushels, around 14 million below the average trade guess, although nearly 100 million higher than a year ago. The lower than expected number came as they reduced 2014 US yields to 47.5 bu/acre from the 47.8 bu/acre that they had previously. They also reduced the 2014 harvested area by 470k acres. That revised down 2014 production to 3.93 billion bushels, down 41.7 million from their previous estimate. Arlan Suderman of Water Street Solutions says that the USDA's September ending stocks estimate has "proved to be too high in 13 of the past 19 years by an average of 101 million bushels." He also points out another very interesting statistic that the "USDA was projecting 2014-15 soybean ending stocks to be 475 million bushels a year ago. We found out this morning that they were actually 191 million bushels." All of this of course casts a fair degree of doubt over the 2015 production and stocks numbers that we currently have before us. Certainly we can now say that old crop carry-in was in fact lower than the USDA thought. In other news the Argentine Ag Min said that farmer selling there on 2014/15 beans was 68.7% complete versus 60.7% a year ago. Growers there have also sold 1% of their new crop, planting of which will begin next month. China’s Golden Week starts tomorrow, meaning that their markets will be closed through to Wednesday October 7. That may reduce export sales somewhat in the week ahead. Before that we are due the usual weekly export sales report from the USDA. Published trade expectations for that are 1.3 MMT to 1.7 MMT for beans, and 100-275,000 MT for meal. There were no sales announcements today. Which beggars the question what's happened to the 13 MMT that China bought last week? Hardly any of that has shown up under the daily reporting system yet. Nov 15 Soybeans closed at $8.92, up 7 3/4 cents; Jan 16 Soybeans closed at $8.94, up 6 1/2 cents; Oct 15 Soybean Meal closed at $308.30, up $2.60; Oct 15 Soybean Oil closed at 27.10, down 36 points. Corn: The corn market closed around a cent or so lower. The USDA put US Sep 1 corn stocks at 1.731 billion bushels almost identical to the average trade estimate of 1.739 billion bushels. The range of estimates was 1.647-1.850 billion and September 1 2014 corn stocks were 1.232 billion. The US Energy Dept reported weekly ethanol production at 943,000 barrels/day, that's up 5,000 bpd from the previous week although that's still the second lowest weekly volume since the first week of May. "Year-to-date corn use for the new marketing year is estimated to be 400 million bushels of corn, up 15 million or 4% from the previous year," said Arlan Suderman. Ethanol stocks shrank by 100,000 barrels from the previous week to 18.8 million barrels. Trade estimates for tomorrow's weekly export sales report are said to be around 700,000 MT to 1.0 MMT. The Argentine Ag Ministry reported farmers there are 73% sold on their 2014/15 corn crop, around the same percentage as this time last year. For new crop they are said to be 1% sold versus 1.7% this time last year. 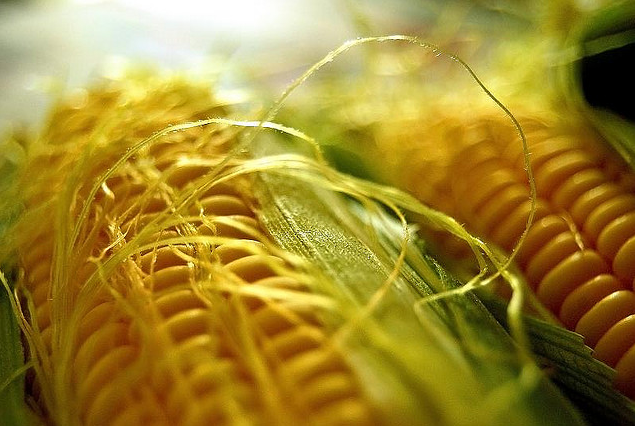 India and Bangladesh are said to be in the market for Brazilian corn. Egypt is also looking for what will probably be either Black Sea of French corn. The Ukraine corn harvest is ongoing and yields are reported to be well below where the USDA believes that they will end up. Russia's corn yields are slightly better than expectations. The EU Commission estimated this year's corn crop at 58.4 MMT versus a previous estimate of 58.7 MMT. Now that we have the USDA's stocks data out of the way, the trade will be looking to see what they have to say in their October WASDE report. Will they finally start to trim back US corn yields, now that they have much more "hard evidence" in from the field? The bulls will be hoping/expecting a 2-3 bu/acre cut to confirm that the worst is over for them. Note the strong seasonal tendency for corn to put in the lows early in October. Dec 15 Corn closed at $3.87 3/4, down 1 1/4 cents; Mar 16 Corn closed at $3.98 3/4, down 1 cent. Wheat: The wheat market closed with decent gains after a fairly friendly USDA report. That put US Sep 1 all wheat stocks at 2.089 billion bushels, up 182 million from the previous year but down 60 million from pre-report trade expectations. US 2015 all wheat production was estimated at 2.052 billion bushels, down 84 million from their August estimate. It was also 81 million below the average trade guess of 2.133 billion bushels, and below the lowest in the range of estimates given. In other news, the EU Commission raised their forecast for this year's EU soft wheat crop to 144.6 MMT versus a previous estimate of 140.7 MMT. That's around the middle of the range of recent analyst's forecasts. The Argentine Ag Ministry said that growers there are almost 100% sold on old crop wheat. 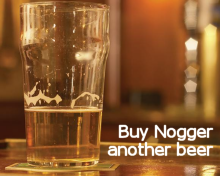 They are also said to be 2.2% sold on new crop versus 5.7% committed this time a year ago. Japan bought 23,600 MT of feed wheat and 12,300 MT of barley in a tender for Dec shipment. Rusagrotrans said that Russia's September grain exports via deep sea ports would only total 1.54 MMT, down from their original forecast of 1.74 MMT, down also from 1.97 MMT in August and also lower than the 1.69 MMT shipped out in September 2014. They suggest that some exports have been held back to take advantage of the new more preferential export duty on wheat that begins tomorrow. There's still plenty of talk of dryness issues in Russia and Ukraine with regards to winter sowings for the 2016 harvest. The Russian wheat harvest is said to be complete on 24.2 million ha (versus only 21.1 million a year ago). That's over 90% of the planned area, producing 60.7 MMT so far (57.8 MMT a year ago), with yields down 8.4% at 2.51 MT/ha. Kazakhstan said that they'd completed harvesting on 11.4 million ha, or 77.3% of plan, producing a crop of 13.76 MMT so far versus 12.83 MMT a year ago. The harvest there should be wrapped up in the next 10-15 days, according to the Ag Ministry. Trade estimates for tomorrow's weekly export sales report are a modest 250-450,000 MT. Dec 15 CBOT Wheat closed at $5.12 3/4, up 9 cents; Dec 15 KCBT Wheat closed at $5.01 3/4, up 7 cents; Dec 15 MGEX Wheat closed at $5.27, up 6 3/4 cents. 30/09/15 -- EU grains have followed US markets mostly a little bit higher, in cautious trade ahead of the USDA's quarterly stocks report and revised US wheat production numbers due this afternoon. At the close, Nov 15 London wheat was up GBP0.10/tonne at GBP115.60/tonne. In Paris, Nov 15 wheat was up EUR0.75/tonne at EUR174.50/tonne, Nov 15 corn was down EUR1.25/tonne to EUR161.25/tonne and Nov 15 rapeseed was EUR0.25/tonne higher at EUR367.50/tonne. Ahead of the USDA data, fresh news is once again fairly thin on the ground. The EU Commission did however give us some revised 2015 EU-28 crop production, export and stocks estimates today. They included a hike in soft wheat production this year from a previous forecast of 140.7 MMT to 144.6 MMT. The EU barley crop was estimated at 59.0 MMT versus a previous estimate of 57.2 MMT. Rapeseed rose to 21.1 MMT from a previous estimate of 20.8 MMT. Corn production was reduced a little to 58.4 MMT versus a previous estimate of 58.7 MMT. The wheat production figure is somewhat below last week's 148.2 MMT forecast from Coceral. Ditto also for barley which the latter had at 60.3 MMT, rapeseed (21.4 MMT) and corn (59.5 MMT). For soft wheat though, lower projected exports in 2015/16 are the main problem, the EU Commission has these at "only" 27.9 MMT, a more than 16% decline on 33.34 MMT last season. That raises carryout at the end of this season to 14.48 MMT, up 32% compared to 2014/15 ending stocks, and the highest since 2009/10. Russia said that it's 2015 grain harvest juggernaut is grinding on, with 38.8 million ha, or 82.6%, of the crop now cut, producing 96.1 MMT so far and yields averaging 2.42 MT/ha. A year ago they'd completed harvesting on 38.0 million ha for a crop of 96.1 MMT, with yields at 2.53 MT/ha. The Russian wheat harvest is said to be complete on 24.2 million ha (versus only 21.1 million a year ago). That's over 90% of the planned area, producing 60.7 MMT so far (57.8 MMT a year ago), with yields down 8.4% at 2.51 MT/ha. The Russian barley harvest is complete on 7.7 million ha (8.5 million a year ago), or nearly 86% of the expected area, for a crop of 17.4 MMT to date (20.3 MMT in 2014 at this time). Yields here are coming in 5.4% lower that last year at 2.27 MT/ha. Corn harvesting is approaching a third complete at 4.4 MMT, with yields slightly higher than a year ago at 5.03 MT/ha. Winter plantings for the 2015 harvest are complete on 11.4 million ha, or 68.3% of the anticipated area, which is 0.5 million ha more than this time last year. Dryness remains, which may explain why planting is ahead of last year's pace, but the region could do with some rain now. The GFS weather model remains pretty dry across the next 15 days, save for the extreme south of the country. Ukraine is also set to receive below normal rainfall across the next two weeks, according to the same forecast. 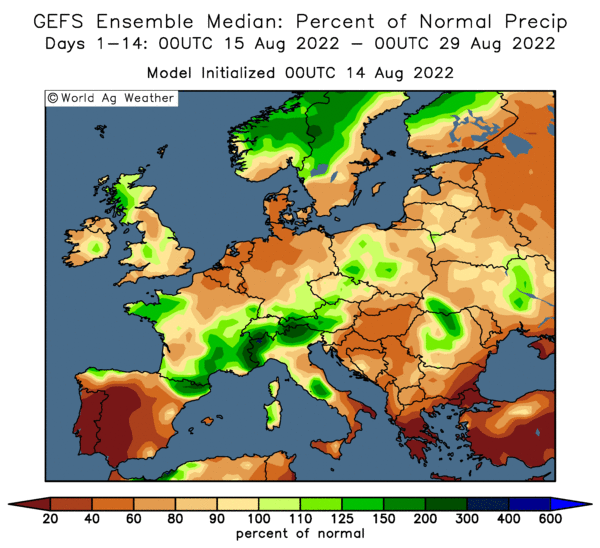 Other weather models offer a slightly more extended chance of rain in southern Russia and western Ukraine, but keep central Russia and eastern Ukraine drier than normal. Kazakhstan said that they'd completed harvesting on 11.4 million ha, or 77.3% of plan, producing a crop of 13.76 MMT so far versus 12.83 MMT a year ago. The harvest there should be wrapped up in the next 10-15 days, according to the Ag Ministry there. Will We Ever See London Wheat At GBP200 Ever Again? 30/09/15 -- "Three good growing seasons are leaving spot grain and oilseed markets in a plentiful supply situation, with farmers feeling the full force of low prices," says the HGCA's Jack Watts. "What’s important to remember is that the current low prices are just one phase of the commodity cycle – how long this phase lasts is up for debate," he adds. Certainly that's a debate that every farmer in the UK, Europe and beyond would like to be involved in. It's 16 months since we saw London wheat trade above GBP150/tonne on a front month, although it was making GBP225/tonne as "fairly" recently as late 2012 - which isn't really that long ago in the overall scheme of things. Also the gap between that and the previous "once in a lifetime" period of London wheat trading in excess of GBP200/tonne was only 18 months. Will we ever see wheat at GBP200/tonne ever again? I believe that we will. When it happens just don't go thinking that "this is the new normal" again that's all. Volatility has been the new normal for some time, and that's one thing that I don't see that changing. 29/09/15 -- Soycomplex: Beans closed higher in a mini Turnaround Tuesday, although they didn't quite manage to reverse all of yesterday's losses. The USDA comes out tomorrow with their September quarterly stocks and small grains report. For beans the trade is expecting US Sep 1 stocks at 205 million bushels, from within a range of estimates of 165-250 million and versus stocks of only 92 million a year previously. AgRural said that Brazilian soybean planting is 1.7% complete versus 1.6% a year ago and 1.3% for the five year average. Mato Grosso is dry, waiting for rain. What has been planted there is likely to be on irrigated land. This isn't unusual for this time of year, "once the monsoon begins, typically by mid October, rainfall should increase sharply to 200-250 millimeters (8-10 inches)," said Martell Crop Projections. "It’s not been proven the El Nino has a strong impact on rainfall in Mato Grosso, but it is a known rain maker in south Brazil’s leading soybean states of Parana and Rio Grande do Sul, although on the negative side, Rio Grande do Sul may be subject to episodic flooding with the El Nino in effect," they add. There's also trade talk of El Nino disrupting palm production in Indonesia and Malaysia, which could support soyoil. At a vegoil conference in India, analyst James Fry was reported to have predicted crude palm oil prices rising 20% by Q1 of 2016 and by 40% from current levels to $700/MT FOB by mid-2016. The Malaysian palm oil market closed at 15 month highs tonight. Oil World's Thomas Mielke estimated that December meal futures could fall to $280-$290 versus tonight's close of $305.50. He estimated 2015/16 global soybean ending stocks at a record 87-88 MMT versus 85 MMT from the USDA. There's talk of some very good yields being reported back from parts of Illinois, Iowa and Minnesota. Nov 15 Soybeans closed at $8.84 1/4, up 7 1/2 cents; Jan 16 Soybeans closed at $8.87 1/2, up 6 3/4 cents; Oct 15 Soybean Meal closed at $305.70, up $1.00; Oct 15 Soybean Oil closed at 27.46, up 28 points. Corn: The market closed around 2 cents firmer, essentially reversing yesterday's declines. Fresh news was pretty light. Trade estimates for tomorrow's USDA Sep 1 quarterly stocks report have these at an average of 1.739 billion bushels. The range of estimates is 1.647-1.850 billion and September 1 2014 corn stocks were 1.232 billion. Concerns about the global, and particularly China’s economy continue. The Shanghai Composite Index closed down 2% today. China’s Golden Week starts Thursday, meaning that their markets will be closed from Oct 1st through to October 7th. The regular weekly US ethanol production report comes out tomorrow. Production last week was only 938,000 barrels per day, down from 961,000 bpd the previous week and the lowest since early May. It will be a concern if that trend continues. Russia said that it's 2015 corn harvest was almost 30% complete on 883k ha, producing a crop of 4.2 MMT to date. Yields are said to be averaging 5.03 MT/ha versus 4.90 MT/ha a year ago and the USDA's final forecast of 5.00 MT/ha. Things don't look so rosy in Ukraine, where the harvest is 18% done on 735k ha for a crop of 3.3 MMT so far. Current average yields are only 4.49 MT/ha versus the USDA's projected 6.59 MT/ha final yield estimate. Stats Canada will updated Canadian crop estimates on Friday. Their corn crop is estimated at an average 12.3 MMT versus the 2014 crop of 11.5 MMT. Argentina’s leading opposition candidate Macri told farm groups yesterday that he would lower soybean export taxes and lift quotas on wheat and corn shipments. So he sounds like a nice man! Their elections are on October 25th. There could still be a bit more US harvest pressure to come, with the crop rapidly reaching maturity and therefore passing any vulnerability to possible early frost damage - not that there's any in the forecast just yet. Corn in Ohio is said to be 70% mature compared to the five year average at this time of only 53%. Dec 15 Corn closed at $3.89, up 2 1/4 cents; Mar 16 Corn closed at $3.99 3/4, up 1 3/4 cents. Wheat: The market closed around 2-3 cents lower. Trade estimates for tomorrow's USDA Sep 1 quarterly stocks report average 2.149 billion bushels from within a range of estimates of 1.987-2.285 billion and versus September 1 2014 all wheat stocks of 1.907 billion. The USDA will also update us on US wheat production tomorrow, with the all wheat crop estimated at an average of 2.133 billion bushels. The range of estimates is 2.105-2.160 billion. The USDA's August estimate was 2.136 billion and output last year was 2.026 billion. Russia said that it had harvested 87% of it's 2015 wheat area, producing a crop of 60.3 MMT in bunker weight so far (ie. before cleaning and screening). Yields are said to be averaging 2.57 MT/ha versus 2.74 MT/ha this time a year ago and compared to the USDA's final season estimate of 2.37 MT/ha. It's the less productive areas that are generally left to be wrapped up, so the final figure should end up lower than the current 2.57 MT/ha. The 2015 Russian barley crop is past 85% harvested at 17.3 MMT with yields averaging 2.27 MT/ha versus 2.40 MT/ha a year ago. Interestingly, the USDA increased their final yield estimate from 2.13 MT/ha to 2.44 MT/ha last month, so achieving the latter now looks unlikely. Japan is tendering for it's regular weekly 128,489 MT of food wheat for Oct-Nov shipment of US, Canadian and Australian origin with the results due Thursday. Friday's Stats Canada report is expected to peg Canadian all wheat production at 25.1 MMT this year, up from their August estimate of 24.625 MMT but down versus the 2014 crop of 29.419 MMT. There's speculation that Egypt's GASC may increase the protein level required in their wheat tenders, which could favour Black Sea material over French and US wheat. Last night's crop progress report shows US winter wheat plantings are lagging normal as dry weather holds things up in some states. Oklahoma plantings are only 21% complete versus the five year average of 33% done at this time. There's talk of recent heavy rain in southern Brazil possibly causing some quality issues for wheat there. Dec 15 CBOT Wheat closed at $5.03 3/4, down 1 3/4 cents; Dec 15 KCBT Wheat closed at $4.94 3/4, down 2 3/4 cents; Dec 15 MGEX Wheat closed at $5.20 1/4, down 2 1/2 cents. 29/09/15 -- EU grains closed mixed but mostly lower, in further consolidation from last week's gains. London wheat got some support from a weaker sterling to finish a bit higher on the nears. Talk of a wetter outlook for Russian and Ukraine winter grain areas seems to have taken the wind out of wheat's sails, at least for now. At the close, Nov 15 London wheat was up GBP0.35tonne to GBP115.50/tonne, Dec 15 Paris wheat was EUR2.00/tonne easier at EUR173.75/tonne, Nov 15 Paris corn was EUR1.00/tonne lower at EUR162.50/tonne, whilst Nov 15 Paris rapeseed was down EUR0.25/tonne at EUR367.25/tonne. Fresh news was pretty thin on the ground today. Sterling closed below 1.35 against the euro last night for the first time since early May. It is also trades only marginally above the lowest close since early May versus the US dollar too. The outlook for the pound then is interesting, is this weakness likely to continue - which would be theoretically supportive for London wheat prices? Or is a resumption of the longer-term uptrend (that's been in place for two years now against the euro) likely to continue? According to new forecasts from Lloyds the pound might peak at around 1.46 versus the single currency in Q4 of this year. For 2016 though, they see that trend reversing, forecasting the pound to drop to 1.42 in Q1 of next year, followed by 1.31 in Q2, 1.28 in Q3 and 1.24 in Q4. Sterling might follow a fairly similar path against the US dollar, although the peak might not come until early 2016. They see the GBP/USD exchange rate at 1.56 by the end of this year, rising to 1.58 in Q1 of 2016. After that, the pound will drop to 1.51 in Q2, 1.47 in Q3 and 1.45 in Q4 of next year, they predict. They have the first UK interest rate rise pencilled in for Feb 2016, a couple of months after they see the Fed starting to raise rates in the US (forecast at Dec 2015). Once the interest rate race begins, it is interesting that Lloyds should forecast the pound to begin to decline against the euro (with the ECB widely expected to be one of the last of the big central banks to join the party). "We still see downside risks for sterling in the medium term, led by concerns about the current account deficit, potential EU referendum uncertainty and more acute fiscal austerity," they said. "In contrast, we believe the euro is structurally undervalued, although further ECB QE is a downside risk," they added. If they're right then UK grains shouldn't go expecting too much help from a weaker domestic currency until Q2 of next year, with the pound forecast to punch above it's current weight prior to then, although there could be some benefit to be derived after that. In other news, Russia said that their harvest was now 81.7% complete on 38.4 million ha, producing a crop of 93.2 MMT to date. Wheat accounts for 60.3 MMT of that total (87.1% done) and barley a further 17.3 MMT (off 85.3% of the planned area). Russia's winter grains plantings for the 2016 harvest are said to be 65.2% complete on 11.2 million ha, which is now 300,000 ha more than this time last year. Russian analysts SovEcon said that it's currently see "no need for weather concerns to the former Soviet Union's wheat crop at this time." 28/09/15 -- Soycomplex: Beans closed around 12 cents lower. Weekly export inspections came in at 530,493 MT, below the expected 550-850,000 MT. Cumulative season to date totals are 95% down on this time last year. The USDA announced 1 MMT of beans sold to China for 2016/17 shipment, which is probably part of last week's "showcase" deal to buy more than 13 MMT over the next two years. The USDA also announced 249,000 MT of US beans sold to unknown for 2015/16 shipment today. The USDA said that the 2015 US soybean harvest had advanced 14 points for the week through to Sunday night and was now 21% complete, up from 16% done this time last year. They said that 74% of the crop is dropping leaves versus 56% last week and 70% a year ago. Good to excellent ratings fell one point to 62% versus 72% a year ago. US harvest pressure may soon be starting to mount, just as Brazil gets going with planting what is expected to be another record soybean area, with growers there encouraged by the slumping value of the real to all time lows against the US dollar. "Analyst Thomas Mielke forecast US soybean futures to find new contract lows over the next few weeks, with the market oversupplied," reported Agrimoney. Recall that the seasonal trend has beans often, although not always, putting in the harvest lows in October, so Mielke (of Oil World fame) could be right. The Argentine Ag Ministry said that farmers there have 67.89% of their 2014/15 soybean crop sold versus 59.79% a year ago. Nov 15 Soybeans closed at $8.76 3/4, down 12 1/2 cents; Jan 16 Soybeans closed at $8.80 3/4, down 12 1/2 cents; Oct 15 Soybean Meal closed at $304.70, down $4.00; Oct 15 Soybean Oil closed at 27.18, down 54 points. 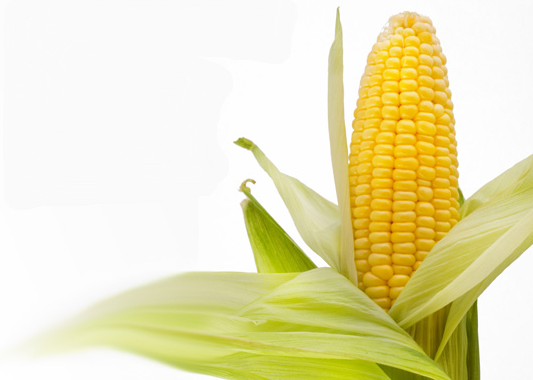 Corn: The corn market closed around a couple of cents lower. Weekly export inspections of 809,386 MT were in line with trade estimates of 750-900,000 MT. Season to date inspections are still only 87% of what they were this time last year. Mexico and Egypt are said to be seeking corn. Bangladesh are said to be buying Brazilian corn, after neighbouring India's crop has been reduced by drought. Corn production in India is forecast around 15% lower than a year ago following back to back summer droughts. The Argentine Ag Ministry said that their corn crop is 71.93% sold versus 71.37% a year ago. The USDA left US corn crop ratings unchanged at 68% good to excellent. They said that the US 2015 harvest was now 18% complete, up 8 points on a week ago (and 7 points ahead of this time last year) but 5 points behind the 5-year average. Maturity is running at 71%, one point behind the recent average. The crop is said to be now 97% dented, in line with the 5-year average. Copa Cogeca estimated the EU-28 corn crop at 55.7 MMT versus 73.8 MMT a year ago. They see the French crop at 13.7 MMT versus 18.0 MMT a year ago. Sharp drops are also forecast from other leading EU corn producing nations, like Italy (down from 8.3 MMT to 7.0 MMT), Romania (down from 11.3 MMT to 7.6 MMT) and Hungary (down from 8.9 MMT to 6.0 MMT). Ukraine's 2015 corn harvest is said to be 18% complete with yields averaging 4.49 MT/ha, still well below the figure that the USDA has factored in. Dec 15 Corn closed at $3.86 3/4, down 2 1/4 cents; Mar 16 Corn closed at $3.98, down 2 1/4 cents. Wheat: The wheat market closed generally a couple of cents lower to unchanged across the three exchanges. Weekly export inspections of 651,194 MT were a bit better than trade ideas of 350-550,000 MT. Cumulative season to date exports are still only 84% of wheat they were a year ago though, and note that the USDA has these down to increase by almost 10% this season. Competition from the Black Sea, Europe and elsewhere remains fierce for US wheat exports. 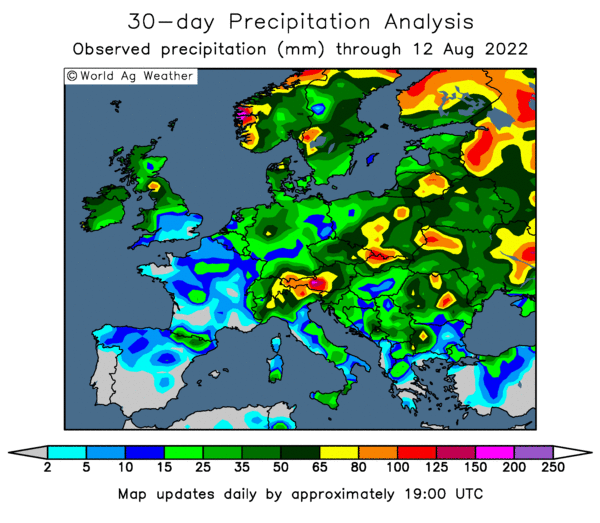 There was talk of some much need rains having fallen in the Ukraine and Russia over the weekend, which would help winter wheat plantings. More rains are in the forecast for Russia’s main southern wheat areas this week. Russia's phytosanitary service said that the country had exported 972.5 TMT of grains in the past week, including 730.5 TMT of wheat. Exports so far this season are 10.8 MMT of grains, of which 8.28 MMT has been wheat, they added. Oman are said to be seeking 60,000 MT of Russian wheat for Nov shipment. Their wheat export duty should have been eased by then. The Argentine Ag Ministry said that their 2014/15 wheat crop is 98.36% sold versus 70.73% a year ago. Sales for 2015/16 are running at 2.10% sold versus 5.36% a year ago. The USDA said that US winter wheat plantings are 31% done, four points behind the norm, but up 12 points on a week ago. Emergence is placed at 7% versus 11% typically at this time and 13% this time last year. 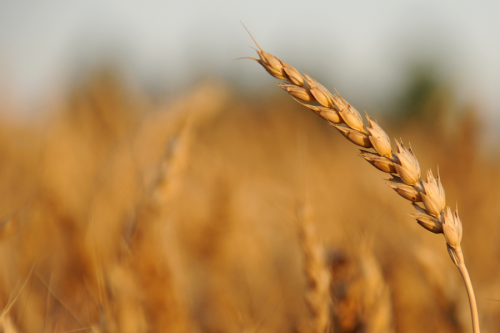 Stats Canada are due to release their 2015/16 wheat production estimates on Friday. Dec 15 CBOT Wheat closed at $5.05 1/2, down 2 1/4 cents; Dec 15 KCBT Wheat closed at $4.97 1/2, down 2 3/4 cents; Dec 15 MGEX Wheat closed at $5.22 3/4, unchanged. 28/09/15 -- EU grains settled mostly lower to begin the new week, possibly considering that last week's decent gains maybe provided something of a selling opportunity? At the close, Nov 15 London wheat was down GBP0.65/tonne to GBP115.15/tonne. In Paris, Dec 15 wheat fell EUR0.75/tonne to EUR175.75/tonne, Nov 15 corn finished EUR1.75/tonne weaker at EUR163.50/tonne and Nov 15 rapeseed ended EUR2.25/tonne lower at EUR367.50/tonne. EU farmer and cooperative body Copa Cogeca estimated the EU-28 soft wheat crop at 146.3 MMT this year, down less than 1% on last season's record, if still almost 2 MMT below Coceral's Friday forecast of 148.2 MMT. They have barley production at 56.7 MMT, down less than 0.5% on last season, but again well below Coceral who were using that estimate as long ago as June, and raised the bar to 60.3 MMT last week. Copa Cogeca peg this year's EU-28 corn crop at 55.7 MMT, down 24.5% on last season's record and 3.8 MMT below Coceral's estimate. They see rapeseed production in the bloc at 20.9 MMT versus Coceral's 21.45 MMT estimate. Fancy that, the EU farmers and own cooperatives organisation estimating production of all four grains/oilseeds lower than Coceral by a combined total of nearly 10 MMT! 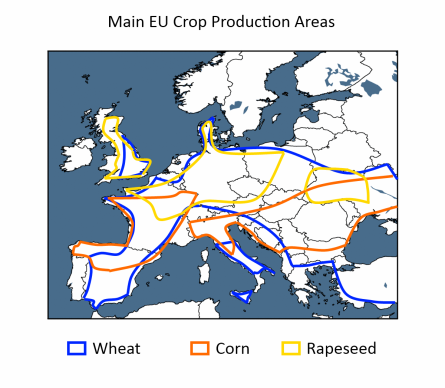 Copa Cogeca incidentally have the UK wheat crop at 15.9 MMT versus 16.6 MMT a year ago, with barley output here at 7.1 MMT versus 7.0 MMT and rapeseed production at 2.3 MMT versus 2.5 MMT. Ukraine said that it had exported 8.86 MMT of grains so far this season, including 4.79 MMT of wheat, 2.70 MMT of barley and 1.35 MMT of corn. Exports of the latter are expected to start to pick up soon once the 2015 harvest is a little more advanced. APK Inform said that Ukraine's seaports shipped out 703.5 TMT of grains last week, down from the previous week's impressive 902.4 TMT total, but still a decent volume. Wheat exports last week accounted for almost 500 TMT, barley nearly 147 TMT whereas corn shipments were little more than 57 TMT. The Ukraine Ag Ministry said that their 2015 grain harvest was now 77% done at nearly 41 MMT. The corn harvest is said to be only 18% complete so far, producing a crop of 3.3 MMT. Average yields of only 4.49 MT/ha to date are still well below the USDA's forecast of 6.59 MT/ha for the season. They also said that the country had now sown 3 million ha of winter grains for the 2016 harvest (or 41% of the government target). Most of that (2.8 million ha) is winter wheat. Winter rapeseed sowings appear stalled at 558k ha, or only 68% of the original forecast. Kazakhstan said that it's 2015 grain harvest was almost 75% done on over 11 million ha for a crop of nearly 13.2 MMT so far. As with Ukraine, Russia's seaports exported less grain last week (447 TMT) than the previous week (535 TMT). Last week's volume included 337 TMT of wheat, 66 TMT of barley and 38 TMT of corn.